Once you are done with the core/base product installation of weblogic server you are ready for next staep i.e creating domains and configuring . A domain is a logically related group of Weblogic Servers that are managed as a unit.A central Weblogic Server, called the administration server, acts as the coordinator and is responsible for the management of the domain. A domain may also include WebLogic Server Clusters. Clusters are groups of WebLogic Servers that work together to provide scalability and high-availability for applications.A minimal domain can contain only one WebLogic Server instance, which always functions as an Administration Server, but at the same time could be acting as a Managed Server. The first step to take is to run the config.sh (*NIX) or config.bat (Windows). In a default WebLogic installation, (with no additional software, such as the SOA Suite or any other product installed) you can find it in the Middleware home, wlserver_10.3/common/bin. 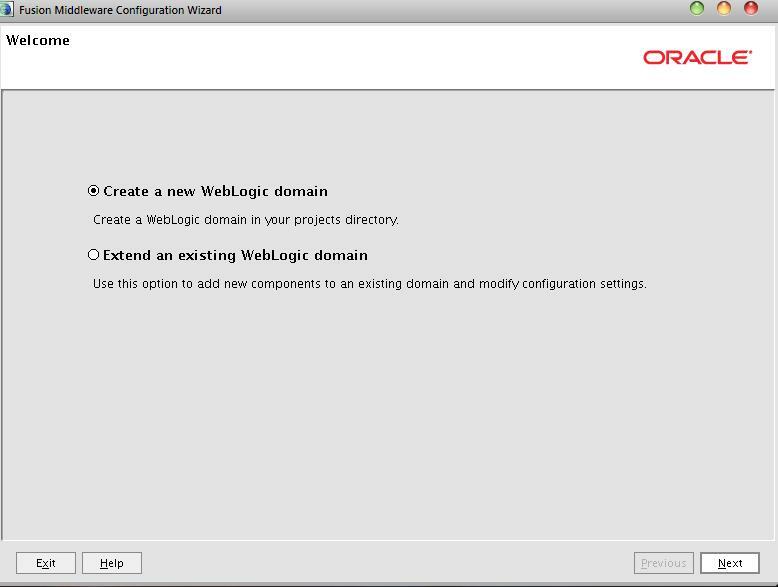 You can choose two modes: GUI or console.You can create offline domains with the WebLogic Scripting Tool using templates. 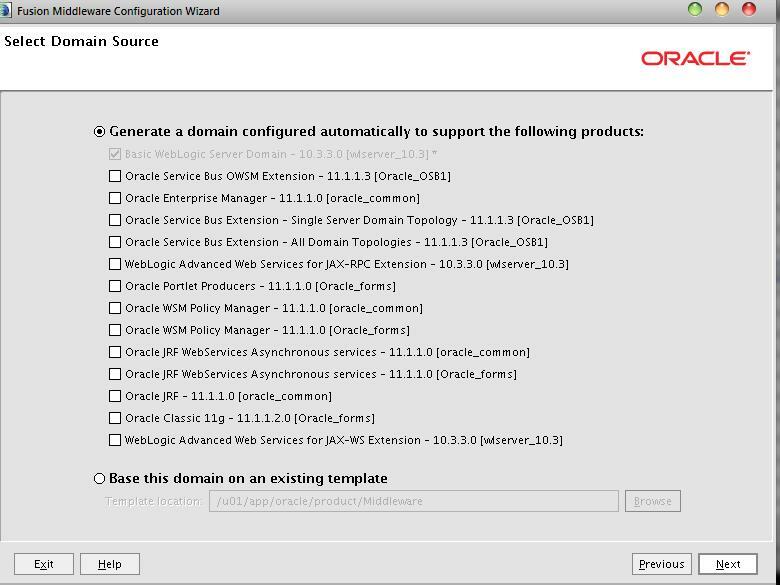 Here we will discuss about weblogic domain creation in GUI mode. Depending on the purpose of your domain, you can add software.For a simple domain, the base template is already selected. This base template, wls.jar is shipped with your WebLogic software, in the WebLogic Server Home, /common/templates. Choose Dev or Prod mode according to your requirement and Choose Sun JDK or JRockit accordingly. 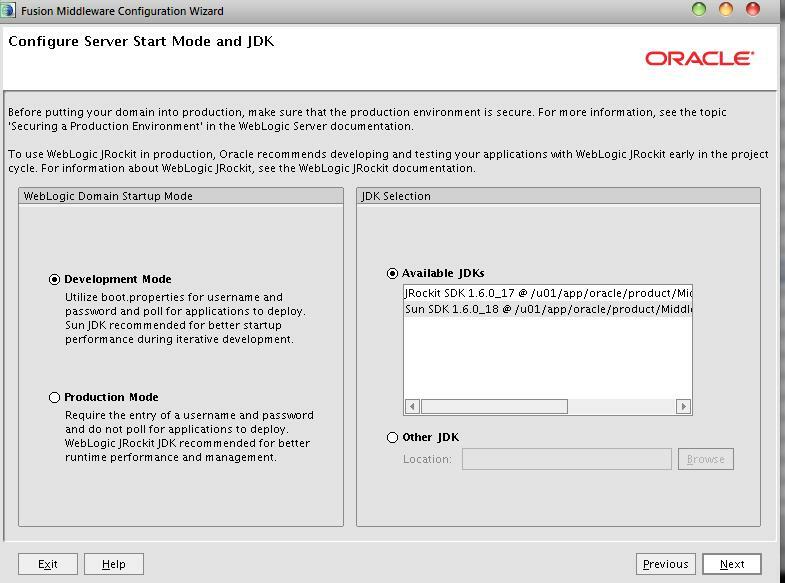 Oracle recommends choosing JRockit in Production modes and Sun for dev but all depends on your requirement. • Stricter security policy: In Production Mode, there will be a stricter security policy at the server level. This means that a file called boot.properties, which contains the encrypted administrator username and password, is not automatically generated. This is used to start up your WebLogic domain for authenticating the Administrator. • Automatic deployment: Automatic deployment of an application is enabled in Development Mode. So when you drop an application in a specific directory, it is automatically deployed by WebLogic Server. This is something that you would not want the default behavior to be in a production environment. In Production Mode, by default, this is switched off. • Debugging: This is disabled by default in Production whereas in Development Mode it is enabled. The reason is apparent, since you usually do not do debugging in production because of the performance impact. • JDK: Prod Mode: JRockit, Dev Mode: Sun: For development it does not matter what you choose, but for production it could be interesting to look at JRockit. It claims to be a very fast JVM with predictable performance. So when real-time hiccups are not wanted because of garbage collection, it might be interesting to look at JRockit. You have some more capabilities for real-time processing through smarter garbage collection. JRockit mission control gives good insight into JVM performance and other statistics. 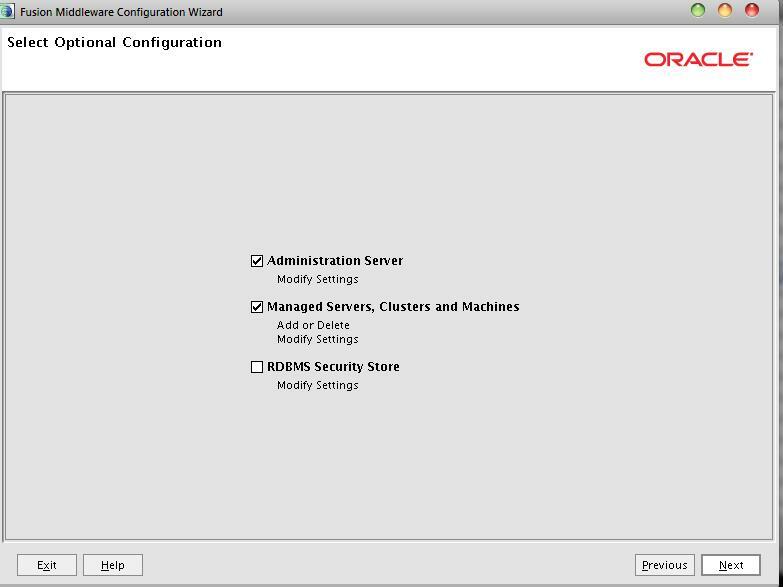 you can select optional components to configure, such as names of Managed Server instances and locations of JMS file stores. Here you can configure some items such as the Administration Servers and Managed Servers. Configure the hostname as the Listen address and choose any available port. Here You should configure a machine for your Node Manager configuration. To use the Node Manager with your Admin and Managed Servers, place them under the machine name. After the creation of your domain is done, you now have to start it in order to login into the Administration Console.